Who doesn’t love a cookie for a snack? These old fashioned oatmeal raisin cookies are delicious. They’re soft and moist, just a little sweet and they hit the spot. I quite often make oatmeal cookies and split the dough into two batches. I’ll make some with chocolate chips or M & M’s and the other half with raisins. That way, everyone’s happy – the chocolate lovers and the chocolate haters. 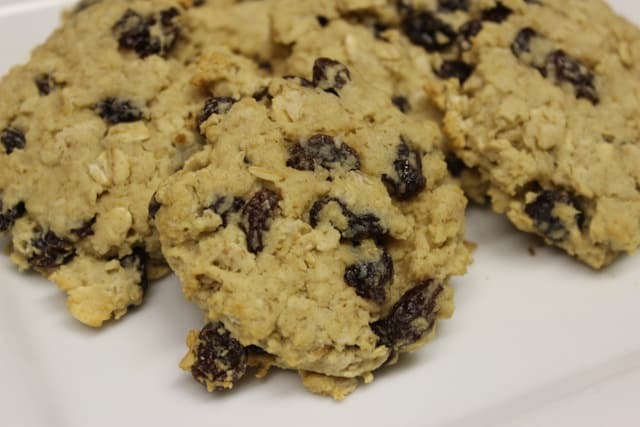 When you make these cookies with raisins, soak the raisins in hot water for 15 or 20 minutes before you add them to the cookies. The raisins will be much plumper and the cookies will be tender and tasty. But, if you’re in a hurry, just toss the raisins in and the cookies will still turn out fabulous. I typically use a combination of quick oats and old fashioned oats. The quick oats mix in a little better, but having some old fashioned oats in the cookie shows that it’s a real oatmeal cookie. These fabulous cookies are moist and tender with just enough sweet to make them the perfect snack or dessert. Cream the butter, applesauce and brown sugar together. Add the eggs and vanilla, beat until well combined. Add the flour, baking soda, cinnamon and salt (if using). Mix until the dough is uniform. Add the oats and raisins. Mix until well combined. Drop the dough by tablespoonfuls onto cookie sheets (ungreased or lined with parchment paper). Allow the cookies to cool on the cookie sheets for 1 minute. Place the cookies on a wire rack to finish cooling. OH My Gosh,I just took my cookies out of the oven and they are to die for….I was even eating some of the dough while I was making them, Can’t wait to share this recipe with my weight watcher friends.. The recipe was so easy to follow and they came out great… Thanks so very much..Can’t wait to make another batch.. Thanks! How did I miss that! Love your recipes. Esp that they have WW points. this sounds so yummy!! Can I pin a recipe from your site? I did not see a pin button. Thanks for your help. Thanks! If you hover your mouse over the picture, a “Pin it” button will show up in the top left corner of the picture. Click the button & you can save it to your pin board. Enjoy!